I’ve restored about 8 of the carts after my wife got me started on them about 1 1/2 years ago. She’s got two in the house and my daughter has one. Restoring these is alot of work. I don’t recommend this as a money making venture but I enjoy working with wood and metal and the girls love them. This makes for a very unique piece for most homes and you’ve really got it cleaned up very well. The ones I’ve seen before any restorations looked like the cleanup would be major. Nice work on this nice little niche project you’ve found. I guess my pics are too big, I’ll do this the hard way as usual. 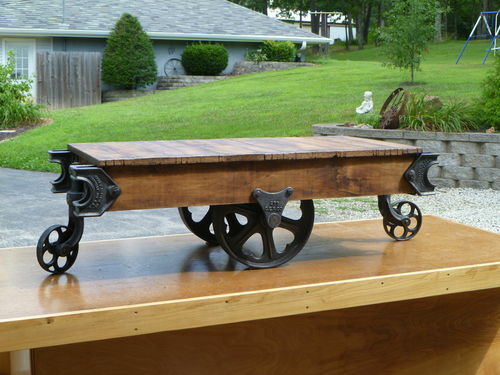 now wouldnt that make a nice base for a toolchest…. must look out for one. Looks like you have quite a collection going. Where are you finding these babies. I like the tool chest application, And the nice job saving the original label on the first example. Found my 1st one @ a local cabinet makers shop while I was snooping around looking for some wood, found some more on CL in the area. Most of these were really rough and much larger originally. Most of the wheels had zerk fittings and they were loaded with 50+ yr old grease. I’d estimate restoration takes me 40+ hrs per cart and longer if some cast iron welding is involved. Like I said they are a lotta work but fun too and the end result has been worth it. Thanks for looking. By the way, the girls like em for coffee tables. 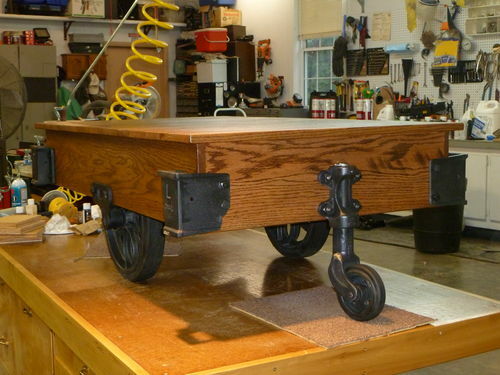 Dave, a very nice restoration project with lots of decorative possibilities. 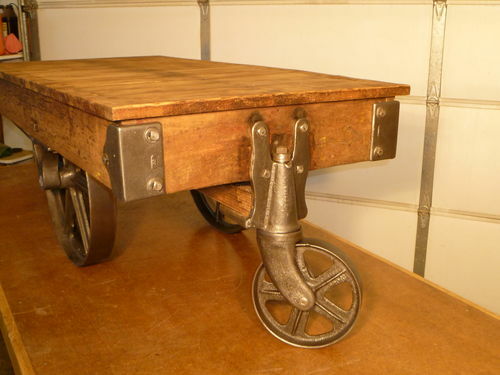 What are these carts called and what were they typically used for? Do you know? 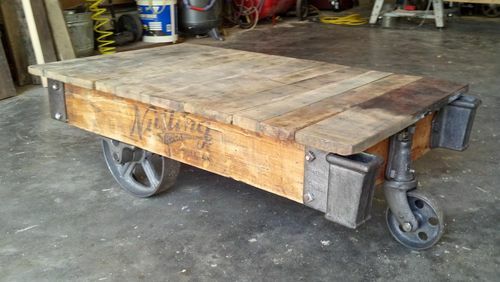 they are called factory carts/ railroad carts/ warehouse carts or something similar. Some of them go back a hundred years or so. Notice the stake pockets on most of them which recieved 4’ stakes so you could really load them down with factory goods of every kind and transport them around a warehouse. 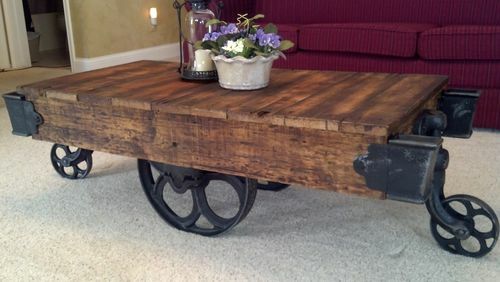 Most of the original lumber was oak or sugar maple and the hardware and wheels were all cast iron, so they were tuff, thats why so many are still around today. Some of the big names are Nutting, Lineberry, Francis, and Towsley. Google them or check out E-bay.